Houston running back Arian Foster left Thursday night’s game against the Indianapolis Colts in the second quarter with an unspecified injury, but returned after a brief absence. Foster was injured Thursday night on a hard hit with about 4 minutes left in the second quarter. He remained on the field for a couple of minutes while trainers looked at him before walking off the field. He came back in two plays later and carried the ball for no gain before going to the locker room. He was back on the field for Houston’s first drive of the second half. 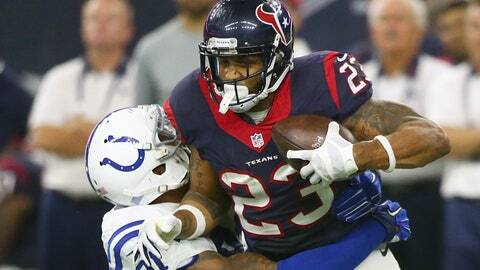 It was Foster’s second game this season after he missed Houston’s first three games after groin surgery. He finished the game, a 27-20 win by the Colts, with 41 yards on 19 carries and 77 yards on nine catches.